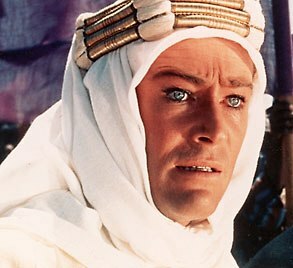 Peter O'Toole o c'hoari Lawrence Arabia. Lawrence of Arabia a zo ur film saoz sevenet gant David Lean e 1962, awenet gant buhez Lawrence Arabia, c'hoariet gant Peter O'Toole. Seizh Oscar en deus bet ar film-se. Un darn eus ar film a zo bet troet e Merthyr Mawr e Kembre.